Here is a simple circuit which can be used as a heat sensor. In the following circuit diagram thermistor and 100 Ohms resistance is connected in series and makes a potential divider circuit . If thermistor is of N.T.C (Negative temperature Coefficient ) type then after heating the thermistor its resistance decreases so more current flows through the thermistor and 100 Ohms resistance and we get more voltage at junction of thermistor and resistance. This concept is so pervasive it has a name: voltage divider. The input-output relationship for this system, found in this particular case by voltage divider, takes the form of a ratio of the output voltage to the input voltage. This output voltage is applied to a NPN transistor through a resistance. Emitter voltage is maintain at 4.7 volt with a help of Zener diode.This voltage we will use as compare voltage. Transistor conducts when base voltage is greater than emitter voltage. 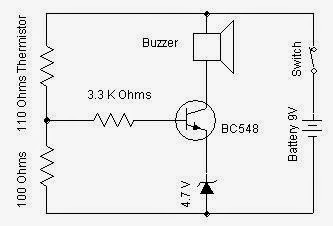 Transistor conducts as it gets more than 4.7 base Voltage and circuit is completed through buzzer and it gives Sound. 0 Response to "Home Made Heat Sensor Circuit"